Depiction of Cyrus the Great by Jean Fouquet, 1470. Cyrus the Great (c. 600 or 576 – 530 BC) figures in the Hebrew Bible as the patron and deliverer of the Jews. He is mentioned 23 times by name and alluded to several times more. According to the Bible, Cyrus the Great, king of Persia, was the monarch under whom the Babylonian captivity ended. In the first year of his reign he was prompted by God to decree that the Temple in Jerusalem should be rebuilt and that such Jews as cared to might return to their land for this purpose. Moreover, he showed his interest in the project by sending back with them the sacred vessels which had been taken from the First Temple and a considerable sum of money with which to buy building materials. The existence of the decree has been challenged. Cyrus the Great is unconditionally praised in the Jewish sources. It is likely that, after the Persian conquest of Babylon, Cyrus had commenced his relationship with the Jewish leaders in exile, and that he later was considered as anointed by God. The Hebrew Bible states that Cyrus issued the decree of liberation to the Jews. Cyrus's edict for the rebuilding of the Temple in Jerusalem marked a great epoch in the history of the Jewish people. 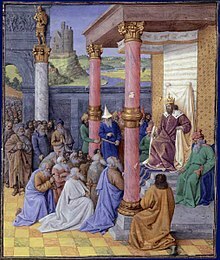 According to Ezra 4:1-6 "the enemies of Judah and Benjamin" asked to help build the temple, and when this was denied hired counselors to frustrate the people of Judah from completing the rebuilding throughout the reign of Cyrus, Xerxes ('Ahasuerus'), and Artaxerxes, until the reign of Darius II. The work recommenced under the exhortations of the prophets, and when the authorities asked the Jews what right they had to build a temple, they referred to the decree of Cyrus. Darius II, who was then reigning, caused a search for this alleged decree to be made, and it was found in the archives at Ecbatana, whereupon Darius reaffirmed the decree and the work proceeded to its triumphant close. A chronicle drawn up just after the conquest of Babylonia by Cyrus gives the history of the reign of Nabonidus ('Nabuna'id'), the last king of Babylon, and of the fall of the Babylonian empire. In 538 BC, there was a revolt in Southern Babylonia, while the army of Cyrus entered the country from the north. In June the Babylonian army was completely defeated at Opis, and immediately afterwards Sippara opened its gates to the conqueror. Gobryas (Ugbaru), the governor of Media, was then sent to Babylon, which surrendered "without fighting," and the daily services in the temples continued without a break. In October, Cyrus himself arrived, and proclaimed a general amnesty, which was communicated by Gobryas to "all the province of Babylon," of which he had been made governor. Meanwhile, Nabonidus, who had concealed himself, was captured, but treated honourably; and when his wife died, Cambyses II, the son of Cyrus, conducted the funeral. Cyrus now assumed the title of "king of Babylon," claimed to be the descendant of the ancient kings, and made rich offerings to the temples. At the same time he allowed the foreign populations who had been deported to Babylonia to return to their old homes, carrying with them the images of their gods. Among these populations were the Jews, who, as they had no images, took with them the sacred vessels of the temple. The Cyrus cylinder, which confirms that Cyrus allowed captives in Babylon to return to their native lands, earning him an honored place in Judaism. However, it has been argued that it must be referring to people associated to the image's cult instead of deportees. Diana Edelman has pointed at the serious chronological difficulties that arise when we accept that the Jews returned during the reign of Cyrus. The terms used by the author of Deutero-Isaiah are reminiscent of certain passages in the Cyrus Cylinder: Traditionally, these passages in Isaiah were believed to predate the rule of Cyrus by about 100 years, however, most modern scholars date Isaiah 40-55 (often referred to as Deutero-Isaiah), toward the end of the Babylonian exile (c. 536 BC). Whereas Isaiah 1-39 (referred to as Proto-Isaiah) saw the destruction of Israel as imminent, and the restoration in the future, Deutero-Isaiah speaks of the destruction in the past (Isa 42:24-25), and the restoration as imminent (Isa 42:1-9). Notice, for example, the change in temporal perspective from (Isa 39:6-7), where the Babylonian Captivity is cast far in the future, to (Isa 43:14), where the Israelites are spoken of as already in Babylon. According to scholar R. N. Whybray, the author of Deutero-Isaiah (chapters 40-55) was mistaken for he thought that Cyrus would destroy Babylon but he did not. Cyrus made it more splendid than ever. But he did allow the Jewish exiles to return home, though not in the triumphant manner which Deutero-Isaiah expected. The historical nature of this decree has been challenged. Professor Lester L. Grabbe has argued that there was no decree but that there was a policy that allowed exiles to return to their homelands and rebuild their temples. He also argues that the archaeology suggests that the return was a "trickle" taking place over perhaps decades, resulting in a maximum population of perhaps 30,000. ^ 2 Chron 36:22-33; Ezra 1:1-8, Ezra 3:7; Ezra 4:3,5; Ezra 5:13-17, Ezra 6:3,14, Isaiah 44:28, Isaiah 45:1,13; Daniel 1:21, Daniel 6:28, Daniel 10:1, and 1 Esdras 2 Archived 2007-09-27 at the Wayback Machine. ^ a b Briant, P., From Cyrus to Alexander: a History of the Persian Empire, (Trans. version), Indiana (2002), p. 46. ^ The Cyrus Cylinder. Translation based on Cogan's, published in W.H. Hallo and K.L. Younger, The Context of Scripture. Vol. II: Monumental Inscriptions from the Biblical World (2003, Leiden and Boston). ^ A. Kuhrt, "The Cyrus Cylinder and Achaemenid Imperial Policy", p. 86–87, in Journal for the Study of the Old Testament 25 (1983). ^ From Old Revelation to New: A Tradition-Historical and Redaction-Critical ... - Simon John De Vries - Google Books. Books.google.ca. Retrieved 2012-05-02. ^ Mercer Dictionary of the Bible - Google Books. Books.google.ca. Retrieved 2012-05-02. ^ Second Isaiah, R. N. Whybray. Books.google.ca. Retrieved 2012-05-02. ^ The Works of Flavius Josephus ,Translated by William Whiston  HOW CYRUS, KING OF THE PERSIANS, DELIVERED THE JEWS OUT OF BABYLON AND SUFFERED THEM TO RETURN TO THEIR OWN COUNTRY AND TO BUILD THEIR TEMPLE, FOR WHICH WORK HE GAVE THEM MONEY. 1. In the first year of the reign of Cyrus (1) which was the seventieth from the day that our people were removed out of their own land into Babylon, God commiserated the captivity and calamity of these poor people, according as he had foretold to them by Jeremiah the prophet, before the destruction of the city, that after they had served Nebuchadnezzar and his posterity, and after they had undergone that servitude seventy years, he would restore them again to the land of their fathers, and they should build their temple, and enjoy their ancient prosperity. And these things God did afford them; for he stirred up the mind of Cyrus, and made him write this throughout all Asia: "Thus saith Cyrus the king: Since God Almighty hath appointed me to be king of the habitable earth, I believe that he is that God which the nation of the Israelites worship; for indeed he foretold my name by the prophets, and that I should build him a house at Jerusalem, in the country of Judea." 2. This was known to Cyrus by his reading the book which Isaiah left behind him of his prophecies; for this prophet said that God had spoken thus to him in a secret vision: "My will is, that Cyrus, whom I have appointed to be king over many and great nations, send back my people to their own land, and build my temple." This was foretold by Isaiah one hundred and forty years before the temple was demolished. Accordingly, when Cyrus read this, and admired the Divine power, an earnest desire and ambition seized upon him to fulfill what was so written; so he called for the most eminent Jews that were in Babylon, and said to them, that he gave them leave to go back to their own country, and to rebuild their city Jerusalem, (2) and the temple of God, for that he would be their assistant, and that he would write to the rulers and governors that were in the neighborhood of their country of Judea, that they should contribute to them gold and silver for the building of the temple, and besides that, beasts for their sacrifices. 3. When Cyrus had said this to the Israelites, the rulers of the two tribes of Judah and Benjamin, with the Levites and priests, went in haste to Jerusalem; yet did many of them stay at Babylon, as not willing to leave their possessions; and when they were come thither, all the king's friends assisted them, and brought in, for the building of the temple, some gold, and some silver, and some a great many cattle and horses. So they performed their vows to God, and offered the sacrifices that had been accustomed of old time; I mean this upon the rebuilding of their city, and the revival of the ancient practices relating to their worship. Cyrus also sent back to them the vessels of God which king Nebuchadnezzar had pillaged out of the temple, and had carried to Babylon. So he committed these things to Mithridates, the treasurer, to be sent away, with an order to give them to Sanabassar, that he might keep them till the temple was built; and when it was finished, he might deliver them to the priests and rulers of the multitude, in order to their being restored to the temple. Cyrus also sent an epistle to the governors that were in Syria, the contents whereof here follow: “KING CYRUS TO SISINNES AND SATHRABUZANES SENDETH GREETING. "I have given leave to as many of the Jews that dwell in my country as please to return to their own country, and to rebuild their city, and to build the temple of God at Jerusalem on the same place where it was before. I have also sent my treasurer Mithridates, and Zorobabel, the governor of the Jews, that they may lay the foundations of the temple, and may build it sixty cubits high, and of the same latitude, making three edifices of polished stones, and one of the wood of the country, and the same order extends to the altar whereon they offer sacrifices to God. I require also that the expenses for these things may be given out of my revenues. Moreover, I have also sent the vessels which king Nebuchadnezzar pillaged out of the temple, and have given them to Mithridates the treasurer, and to Zorobabel the governor of the Jews, that they may have them carried to Jerusalem, and may restore them to the temple of God. Now their number is as follows: Fifty chargers of gold, and five hundred of silver; forty Thericlean cups of gold, and five hundred of silver; fifty basons of gold, and five hundred of silver; thirty vessels for pouring [the drink-offerings], and three hundred of silver; thirty vials of gold, and two thousand four hundred of silver; with a thousand other large vessels. (3) I permit them to have the same honor which they were used to have from their forefathers, as also for their small cattle, and for wine and oil, two hundred and five thousand and five hundred drachme; and for wheat flour, twenty thousand and five hundred artabae; and I give order that these expenses shall be given them out of the tributes due from Samaria. The priests shall also offer these sacrifices according to the laws of Moses in Jerusalem; and when they offer them, they shall pray to God for the preservation of the king and of his family, that the kingdom of Persia may continue. But my will is, that those who disobey these injunctions, and make them void, shall be hung upon a cross, and their substance brought into the king's treasury." And such was the import of this epistle. Now the number of those that came out of captivity to Jerusalem, were forty-two thousand four hundred and sixty-two.". Initial text from Easton's Bible Dictionary, 1897 and Schaff-Herzog Encyclopaedia of Religion. Chronicle of Nabonidus and other documents in the British Museum. This page was last edited on 22 March 2019, at 03:16 (UTC).